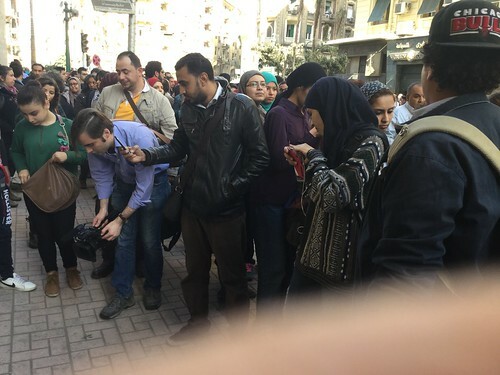 Egyptian women gathered Thursday to protest the killing of activist Shimaa Al-Sabbagh, in the same spot in downtown Cairo where she was murdered by police on the 24th of January. 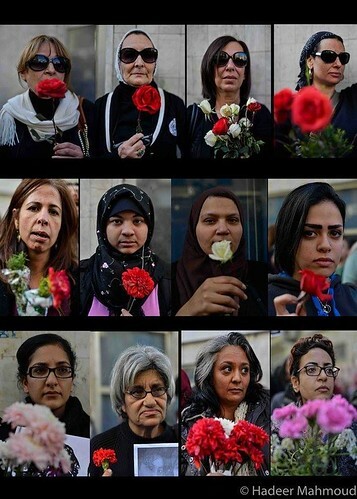 The protesters held pictures of Shimaa and roses to honor the fallen activist, who was on her way to lay flowers in Tahrir Square, before she was shot and killed by security forces. The protesters chanted against the police state and against the Ministry of Interior; a few held pictures of Minister of Interior Mohamed Ibrahim, with the word "killer" and "wanted" written down. The activists chanted "as long as the Egyptian blood is cheap, down with any President", and "The Ministry of Interior are thugs". The protest was cut short due to the emergence of a counter-protest on the opposite side of the street, where a small group of men and women started chanting in support of police. Some activists were convinced that the counter-protest was organized by the police. The pro-police protest tried to harass the female activists. The protest ended in thirty minutes, to avoid violence. Police officers were seen holding semi-automatic guns, in an attempt to intimidate the women. The word spread that police were closing roads to surround protesters, and the women decided to peacefully disperse. A police informant in plain clothes, was seen taking pictures of the protest and later delivered the camera to a high ranking police officer. 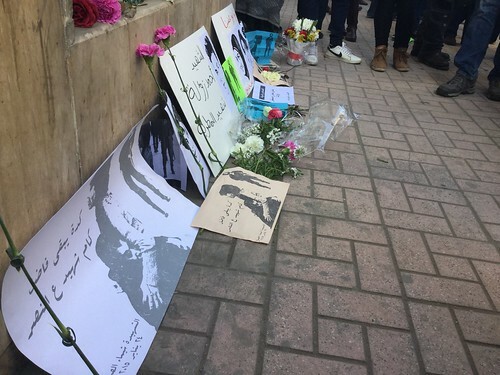 Towards the end of the peaceful stand, flowers and pictures of Shimaa were laid on the ground, on the spot where she was murdered, but sadly security forces destroyed the small shrine dedicated to her. Images of a police officer with a big blue garbage bag collecting the pictures and the flowers circulated online, amid sadness and shock. The activists vowed to continue protesting, as long as the police state is suffocating civil rights and freedoms in the country.